Before we can go into the effectiveness of diabetes testing, we must understand what diabetes is. Diabetes is our body’s way of providing growth and energy. The foods we eat get broken down into glucose, which our body uses as fuel. Glucose enters our bloodstream where it is then utilized for growth and energy. The pancreas produces a hormone called insulin. In order for our cells to use glucose, our blood requires the insulin. This production moves the glucose from the blood cells to other cells so that it can create energy and growth. If enough insulin is failed to be produced, or our cells do not use it properly, you end up with the disease known as diabetes. Insulin is essential in regulating the body’s blood sugar levels. If left untreated, diabetes can cause serious health issues, and be life threatening. If a person experiences symptoms, they should be tested right away. There are a number of tests to diagnose or rule out diabetes. The sugar level test requires a drop of blood to measure the glucose levels in the blood. This particular test requires a person to fast, which means no food or drink, for at least eight (8) hours prior to testing. Unfortunately, for patients that are already going through dialysis treatment, this form of testing has not been found to be especially accurate. To prevent further kidney disease, heart attack, stroke, nerve damage, or blindness, glucose levels must be controlled. Hemodialysis is where the blood is filtered through an artificial kidney machine. Another test, that can be conducted in the comfort of the patients own home, is the peritoneal dialysis, where fluid is passed in through the abdomen. The A1C test may not be accurate for diabetic dialysis patients due to the fact that they often have very high blood sugar levels. The A1C test reacts with the glucose in a patient’s blood, measuring the hemoglobin percentage. The glycated-albumin test measures how the glucose reacts to albumin, a protein in plasma. For patients on hemodialysis, the glycated-albumin test brought higher blood sugar levels, than those that were tested with the A1C method. The difference may be due to the fact the A1C test relies on the red blood cells, which for patients on dialysis, do not survive for long. Patients on dialysis receive medication to help stimulate the red blood cells production rate. Results, confirmed by testing on Japanese patients, showed that the glycated-albumin test was more accurate than the A1C test for monitoring glucose levels in the blood of hemodialysis patients. According to some researchers, the glycated-albumin test is more accurate than A1C test when it comes to measuring the blood sugar among patients who are on hemodialysis. This information is also confirmed by the Japanese diabetic patients. This glycated-albumin test is yet to be proved with patients on peritoneal dialysis as well as to patients with kidney disease but not yet on dialysis. These are always showy. Just gave it a touch of sharpening. Not much. I get some nice backlighting in the garden at times. The sweet potato (Ipomoea batatas) is a dicotyledonous plant which belongs to the family Convolvulaceae. Amongst the approximately 50 genera and more than 1000 species of this family, only I. batatas is a crop plant whose large, starchy, sweet tasting tuberous roots are an important root vegetable (Purseglove, 1991; Woolfe, 1992). The young leaves and shoots are sometimes eaten as greens. The sweet potato is only distantly related to the potato (Solanum tuberosum). It is commonly called a yam in parts of North America, although they are only very distantly related to the other plant widely known as yams) (in the Dioscoreaceae family), which is native to Africa and Asia. Sweet potatoes are native to the tropical parts of the South America, and were domesticated there at least 5000 years ago. They spread very early throughout the region, including the Caribbean. They were also known before western exploration in Polynesia. How exactly they arrived there is a subject of ongoing research and discussion of various hypotheses involving archaeological, linguistic and genetic evidence. Austin (1988) postulated that the centre of origin of I. batatas was between the Yucatán Peninsula of Mexico and the mouth of the Orinoco River in Venezuela. The ‘cultigen’ had mostly likely been spread by local people to South America by 2500 BC. Zhang et al. (1998) provided strong supporting evidence that the geographical zone postulated by Austin is the primary centre of diversity. The much lower molecular diversity found in Peru-Ecuador suggests that this region be considered as secondary centre of sweet potato diversity. Sweet potatoes are now cultivated throughout tropical and warm temperate regions wherever there is sufficient water to support their growth. According to the Food and Agriculture Organization (FAO]) statistics world production in 2004 was 127,000,000 tons. The majority comes from China with a production of 105,000,000 tonnes from 49,000 km². About half of the Chinese crop is used for livestock feed. Per-capita production is greatest in countries where sweet potatoes are a staple of human consumption, led by the Solomon Islands at 160 kg per person per year, Burundi at 130 kg and Uganda at 100 kg. In New Zealand, sweet potato is known by its Māori name, kūmara. It was a staple food for Māori before European contact. Today, it is still very popular, although less popular than regular potatoes. There are about 85 commercial kūmara growers, with 1,220 hectares producing 20,000 tonnes of kūmara annually. In the U.S., North Carolina, the leading state in sweet potato production, provided 38.5% of the 2007 U.S. production of sweet potatoes. California, Louisiana, and Mississippi compete closely with each other in production. Louisiana has been a long-time major producer, once second only to North Carolina, and closely followed by California until the latter began surpassing it in 2002. In 2007, California produced 23%, Louisiana 15.9%, and Mississippi 19% of the U.S. total. Opelousas, Louisiana’s Yambilee has been celebrated every October since 1946. The Frenchmen who established the first settlement at Opelousas in 1760 discovered the native Attakapas, Alabama, Choctaw, and Opelousas Indian Tribes eating sweet potatoes. The sweet potato became a favorite food item of the French and Spanish settlers and thus continued a long history of cultivation in Louisiana. Mississippi is also a major sweet potato producing state, with about 150 farmers presently growing sweet potatoes on approximately 8,200 acres (33 km2) and contributing million dollars to the state’s economy. Mississippi’s top five sweet potato producing counties are Calhoun, Chickasaw, Pontotoc, Yalobusha, and Panola. The National Sweet Potato Festival is held annually the entire first week in November in Vardaman (Calhoun County), which proclaims itself as "The Sweet Potato Capital". The town of Benton, Kentucky celebrates the sweet potato annually with its Tater Day Festival on the first Monday of April. The town of Gleason, Tennessee celebrates the sweet potato on Labor Day weekend with its Tater Town Special. The plant does not enjoy frost. It grows best at an average temperature of 24 °C (75 °F), abundant sunshine and warm nights. Annual rainfalls of 750-1000 mm are considered most suitable, with a minimum of 500 mm in the growing season. The crop is sensitive to drought at the tuber initiation stage 50-60 days after planting and is not tolerant to water-logging, as it may cause tuber rots and reduce growth of storage roots if aeration is poor (Ahn, 1993). Depending on the cultivar and conditions, tuberous roots mature in two to nine months. With care, early-maturing cultivars can be grown as an annual summer crop in temperate areas, such as the northern United States. 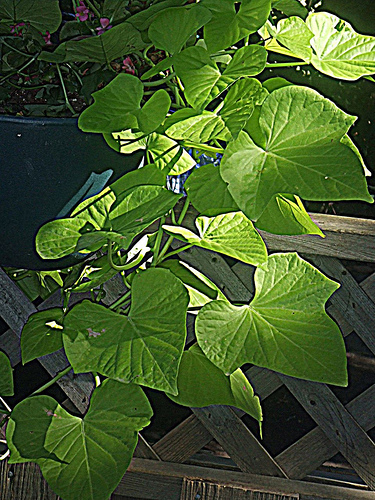 Sweet potatoes rarely flower when the daylight is longer than 11 hours, as is normal outside of the tropics. They are mostly propagated by stem or root cuttings or by adventitious roots called "slips" that grow out from the tuberous roots during storage. True seeds are used for breeding only. Under optimal conditions of 85 to 90 % relative humidity at 13 to 16 °C (55 to 61 °F), sweet potatoes can keep for six months. Colder temperatures injure the roots. They grow well in many farming conditions and have few natural enemies; pesticides are rarely needed. Sweet potatoes are grown on a variety of soils, but well-drained light and medium textured soils with a pH range of 4.5-7.0 are more favourable for the plant (Woolfe, 1992; Ahn, 1993). They can be grown in poor soils with little fertilizer. However, sweet potatoes are very sensitive to aluminium toxicity and will die about 6 weeks after planting if lime is not applied at planting in this type of soil (Woolfe, 1992). Because they are sown by vine cuttings rather than seeds, sweet potatoes are relatively easy to plant. Because the rapidly growing vines shade out weeds, little weeding is needed, and farmers can devote time to other crops. In the tropics the crop can be maintained in the ground and harvested as needed for market or home consumption. In temperate regions sweet potatoes are most often grown on larger farms and are harvested before frosts set in. China is the largest grower of sweet potatoes; providing about 80% of the world’s supply, 130 million tons were produced in one year (in 1990; about half that of common potatoes). Historically, most of China’s sweet potatoes were grown for human consumption, but now most (60%) are grown to feed pigs. The rest are grown for human food and for other products. Some are grown for export, mainly to Japan. China grows over 100 varieties of sweet potato. After introduction there, sweet potatoes very early became popular in the islands of the Pacific Ocean, from Japan to Polynesia. One reason is that they were a reliable crop in cases of crop failure of other staple foods due to typhoon flooding. They are featured in many favorite dishes in Japan, Taiwan, the Philippines, and other island nations. Indonesia, Vietnam, India, and some other Asian countries are also large sweet potato growers. Uganda (the third largest grower after Indonesia), Rwanda, and some other African countries also grow a large crop which is an important part of their peoples’ diets. North and South America, the original home of the sweet potato, together grow less than three percent of the world’s supply. Europe has only a very small sweet potato production, mostly in Portugal. In the Caribbean, a variety of the sweet potato called the boniato is very popular. The flesh of the boniato is cream-colored, unlike the more popular orange hue seen in other varieties. Boniatos are not as sweet and moist as other sweet potatoes, but many people prefer their fluffier consistency and more delicate flavor. Boniatos have been grown throughout the subtropical world for centuries, but became an important commercial crop in Florida in recent years. Sweet potatoes were an important part of the diet in the United States for most of its history, especially in the Southeast. From the middle of the 20th century, however, they have become less popular. The average per capita consumption of sweet potatoes in the United States is only about 1.5-2 kg (4 lbs) per year, down from 13 kg (31 lb) in 1920. Southerner Kent Wrench writes: "The Sweet Potato became associated with hard times in the minds of our ancestors and when they became affluent enough to change their menu, the potato was served less often." New Zealanders grow enough kūmara to provide each person with 7kg (15.4 lbs) per year, and also import substantially more than this from China. Besides simple starches, sweet potatoes are rich in complex carbohydrates, dietary fiber, beta carotene (a vitamin A equivalent nutrient), vitamin C, and vitamin B6. Sweet potato varieties with dark orange flesh have more beta carotene than those with light colored flesh and their increased cultivation is being encouraged in Africa where Vitamin A deficiency is a serious health problem. Despite the name "sweet", it may be a beneficial food for diabetics, as preliminary studies on animals have revealed that it helps to stabilize blood sugar levels and to lower insulin resistance. Some Americans, including television personality Oprah Winfrey, are advocating increased consumption of sweet potatoes both for their health benefits and because of their importance in traditional Southern cuisine. The roots are most frequently boiled, fried, or baked. They can also be processed to make starch and a partial flour substitute. Industrial uses include the production of starch and industrial alcohol. Although the leaves and shoots are also edible, the starchy tuberous roots are by far the most important product. In some tropical areas, they are a staple food-crop. "Amukeke" (sun dried slices of storage roots) and "Inginyo" (sun dried crushed storage roots) are a staple food for people in north-eastern Uganda (Abidin, 2004). Amukeke is mainly for breakfast, eaten with peanut sauce. People generally eat this food while they are drinking a cup of tea in the morning, around 10 am. Inginyo will be mixed with cassava flour and tamarind, to make food called "atapa". People eat "atapa" with smoked fish cooked in peanut sauce or with dried cowpea leaves cooked in peanut sauce. Candied sweet potatoes are a side dish consisting mainly of sweet potatoes prepared with brown sugar, marshmallows, maple syrup, molasses, or other sweet ingredients. Often served on American Thanksgiving, this dish represents traditional American cooking and indigenous food. Sweet potato pie is also a traditional favorite dish in southern U.S. cuisine. Sweet potato fries or chips are another common preparation, and are made by julienning and deep frying sweet potatoes, in the fashion of French fried potatoes. Sweet potato leaves are a common side dish in Taiwanese cuisine, often boiled with garlic and vegetable oil and dashed with salt before serving. They are commonly found at bento (POJ: piān-tong) restaurants, as well as dishes featuring the sweet potato root. The young leaves and vine tips of sweet potato leaves are widely consumed as a vegetable in West African countries (Guinea, Sierra Leone and Liberia for example), as well as in northeastern Uganda, East Africa (Abidin, 2004). According to FAO leaflet No. 13 – 1990, sweet potato leaves and shoots are a good source of vitamins A, C, and B2 (Riboflavin), and according to research done by A. KHACHATRYAN, are an excellent source of lutein. Steamed/Boiled chunks, for a simple and healthy snack, chunks of sweet potato may be boiled in water or cooked in the microwave. Sweet Potato Butter can be cooked into a gourmet spread. In Northeastern Chinese cuisine. sweet potatoes are often cut into chunks and fried before drench into a pan of boiling syrup. Japanese cuisine: Boiled sweet potato is the most common way to eat it at home. Also, the use in vegetable tempura is common. Yaki-imo (roasted sweeted potato) is a delicacy in winter, sold by hawkers. Daigaku-imo is a baked sweet potato dessert. In imo-gohan, slices or small blocks of sweet potato are cooked in rice. It is also served in nimono or nitsuke, boiled and typically flavoured with soy sauce, mirin and dashi. Because it is sweet and starchy, it is used in imo-kinton and some other wagashi (Japanese sweets). Shōchū, a Japanese spirit normally made from the fermentation of rice, can also be made from sweet potato, in which case it is called imo-jōchū. In New Zealand, Māori traditionally cooked their kūmara in hāngi (earth ovens). Rocks were placed on a fire in a large hole. When the fire died out, kūmara and other food was wrapped in leaves and placed on the hot rocks, then covered with earth. The kūmara was dug up again several hours later. The resulting food was very soft and tender, as though steamed. In Korean cuisine, sweet potato starch is used to produce dangmyeon (cellophane noodles). Sweet potatoes are also boiled, steamed or roasted, and young stems are eaten as namul. The aerial parts are used as a galactogogue. The leaves are used to treat diabetes, hookworm, hemorrhage, and abscesses. The tuber is used to treat asthma. Often called a yam, the sweet potato is not in the Yam family, but that is only the beginning of the confusion (see yams). Nor is the sweet potato closely related to the common potato. The first Europeans to taste sweet potatoes were members of Columbus’ expedition in 1492. Later explorers found many varieties under an assortment of local names, but the name which stayed was the indigenous Taino name of batata. This name was later transferred to the ordinary potato, causing a confusion from which it never recovered. The first record of the name "sweet potato" is found in the Oxford English Dictionary of 1775. The moist-fleshed, orange cultivars of sweet potato are referred to as sweet potatoes or "yams" in the United States. One explanation of this usage is that Africans brought to America took to calling American sweet potatoes Nyamis, perhaps from the Fulani word nyami (to eat) or the Twi word anyinam, which refers to a true yam. The Spanish took the Taino name batata directly, and also combined it with the Quechua word for potato, papa, to create the word patata for the common potato. In Mexico, and Central America the sweet potato is called by the Nahuatl-derived name camote. In Peru, the Quechua name for a type of sweet potato is kumar, strikingly similar to the Polynesian name kumara (see below). In South America, Peruvian sweet potato remnants dating as far back as 8,000 BCE have been found. Substratum names used in local varieties of English include kumara (from the Māori word kūmara), as it was the staple food of the native Māori diet, in Australasia (in NSW it is sometimes spelled as "Kumera", although "sweet potato" is more common in Australia, at least in Victoria). The term is also used in indigenous languages of Melanesia, as well as "peteita". The name camote is used in the Philippines, introduced from Mexico (see above). In the Papua New Guinean language of Tok Pisin is it known as cau cau. In Hawaiʻi substratum names are used for the yellow Japanese variety (紫芋, murasaki imo, lit. "purple potato" or サツマイモ, Satsumaimo, "Satsuma potato") and the purple Okinawan variety (紅芋, beni imo, lit. "crimson potato", Ipomoea batatas cv. Ayamurasaki), both of which are commonly available in the marketplace. The local Japanese names are widely recognized, with Satsumaimo “Satsuma potato” used by recent Japanese immigrant families and yamaimo (“mountain potato”) by other groups. (Technically, yamaimo is the proper name in Japanese of the native yam; however, as in English, it is often used to refer to the sweet potato.) However, naming often depends on personal ancestry, with e.g. Sāmoan ʻumala among Sāmoans, Tagalog kamote among Filipinos (derived from Mexican Spanish camote; see above), and Hawaiian ʻuala among Native Hawaiians. In addition to the Fulani and Twi names which probably are the source of the United States usage "yam", in Kenya "Ngwaci" is the Kikuyu word for sweet potatoes. The Kiswahili word is "viazi tamu", literally sweet potatoes. In Uganda, people call it as potato. Meanwhile, the ‘solanum’ potato is called ‘Irish’ potato.